Gucci may be known for luxe textiles and flashy cuts, but the Italian fashion house’s latest offering negotiates waterlogged sidewalks as well as it does the catwalk. 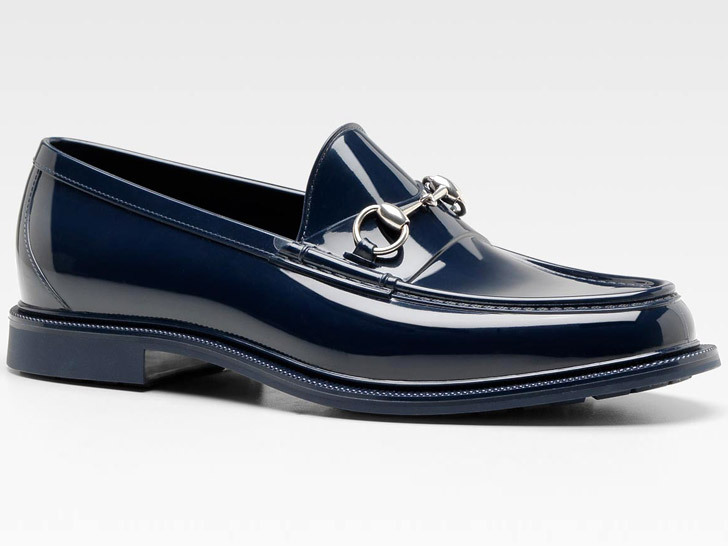 The patent rubber moc, a modern update of the company’s classic bit loafer, eschews leather in favor of durable (and vegan!) rubber, making it the perfect shoe to pull on once summer flies the coop and the weather turns sour. It’s available now in a burnished midnight blue or a Wellie-esque hunter green—just what the weatherman ordered to go singing in the rain. First beautiful thing Gucci done for this world, for the Planet, for animals, for people. Keep going, keep doing this Gucci, I will buy any and every non leather Gucci product. I dont intent to spend smallest amount of my cash of any material which came from charming animal. I feel very proud for that Gucci made this step. I want to wear non leather gucci handbags and shoes too. Not only Stella. I want more! Fantastic, please bring on more vegan shoes!!!!! Gucci may be known for luxe textiles and flashy cuts, but the Italian fashion house's latest offering negotiates waterlogged sidewalks as well as it does the catwalk. The patent rubber moc, a modern update of the company's classic bit loafer, eschews leather in favor of durable (and vegan!) rubber, making it the perfect shoe to pull on once summer flies the coop and the weather turns sour. It's available now in a burnished midnight blue or a Wellie-esque hunter green�just what the weatherman ordered to go singing in the rain.